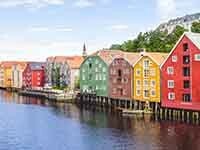 Trondheim is the third largest city in Norway. Here lives 193 000 inhabitants, which by European standards is not much at all. However, life here beats the key - mainly because of the students, who in the city are more than 30 000 thousand. They organize many city events and participate in cultural events.